If you are like 99% of guitar players, you heavily rely on the minor pentatonic scale. Perhaps you learned how to add color to your positions by adding the wonderful blue note between the 4th and 5th. If you recognize yourself in the previous description, you might feel that your leads all sound the same after a while. Your bluesy musical vocabulary might be getting old and you might feel like you need more options to expand your phrasing. The problem is that you don’t necessary want to spend countless hours learning the mysteries of music theory. No need to worry! In this article, we’ll discuss very simple ways to help your lead sound better without having to know everything there is to know about music theory. Before discussing the elements we’ll add to enrich your playing, let’s define the tools you should be comfortable with: the minor pentatonic scale. We’ll use the following minor position in all the ideas we’ll develop. Make sure you are comfortable with that position. The position is written in A, but you can easily transpose the scale to any desired key by starting it with a different fret. You should be able to play it without looking at your fretboard and be able to improvise with it. Let’s take a closer look to the notes that make the previous minor pentatonic: Root, min 3rd, 4th, 5th and min 7th. Two notes are missing to that scale to make it a full seven note scale: the 2nd and the 6th. These two notes can add great color to your leads. Before incorporating these two notes to our pentatonic scales, let’s take a closer look at the nature of these additions. Two types of seconds are available: the minor second and the major second. They both have very unique sounds and it is recommended that you get familiar with them before incorporating them in your leads. The minor second is the smallest interval found in western music. Only a half step separates a minor second from its root. The minor second adds a tensed sound to your lead and is often used in middle eastern music. The major second is more commonly used than the minor second. The distance between a major second and its root is a full step. The major second tends to open up your lead. It can add a very nice melodic touch to your improvisations. Just like the seconds, there are two types of sixths available: the minor sixth and the major sixth. Again, being able to hear the sound of these notes will give you more control over your music. The minor sixth tend to sound darker and sadder than the major sixth. It is used in many minor scales and can add a very mellow touch to your lead. The major sixth adds a melodic appeal to your scale. It usually opens up your melodies and adds a positive sound to your lead. As we just discussed, there are four possible notes we can add to our minor pentatonic scale. To make a scale work with a chord, you should know that it is not a good idea to use two types of the same interval in the same scale. Following are all the possibilities we get when adding both types of seconds and sixths to the minor pentatonic scale. We will later take a more visual approach, but they are listed below to demonstrate how minor pentatonic scales are found in many more complex seven note scales. Let’s go back to the first position of A minor pentatonic. The position takes place between frets 5 and 8. That means that we will add the previously discussed additional notes in the same area of the fretboard determined by our position. Take a moment to memorize where these notes are found in relation to the first minor pentatonic position. Make sure you are able to play any of the desired additional notes without having to think about it. In the next section, we’ll experiment with several simple licks. Let's start with a very simple minor pentatonic to which we’ll add one of the additional notes we just discussed. Play these licks several times and anticipate the sound of every note. You should be able to hear the licks prior to playing them. We replaced the last note with a major second. You may replace any note from the lick with an additional note of your choice depending on which way you want to take your music. Spend time developing new ideas adding a second or sixth to some of your favorite licks. Another way to easily add color to your licks is to use chromatic passages. A chromatic scale is a scale made of all the possible notes. These notes are all placed a half step apart. Because a chromatic passage is made of all possible notes, some will work and others won’t. In order to use chromaticism in your leads, it’s important to avoid resting on one of the notes that is not part of the original scale. Chromatic notes will be used as passing notes. In the following minor pentatonic scales, we will use chromatic passages. To facilitate your phrasing and your awareness of the notes that are in, we’ll use chromatic notes to “fill in” the blanks left in between the correct notes of the scale. We’ll use ghost colored notes for all the additional chromatic notes. As you go through the following licks, study the notes and notice how the chromatic notes are used in relation to the notes of the 1st position of A minor pentatonic. As you develop new phrasing ideas, experiment with these chromatic ideas. Remember to land on one of the correct notes of the scale. Chromatic passages should be used as passing notes. Notice also how the chromatic passages are played with a constant flow of notes. Sixteenth notes are usually a good choice when it comes to phrasing efficiently. 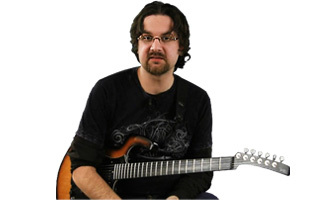 Let’s explore a new way to spice up your pentatonic phrasing by creating custom pentatonic scales. This is done by choosing five notes and use them as you would with a regular minor pentatonic scale. The five notes you chose will be determined by the color you wish to give to your music. Let’s consider an A minor triad. That chord is made of the three following notes: Root, minor 3rd and 5th. You may add two additional notes to create a custom pentatonic scale. You can develop that way new scales and ideas to use in your improvisations. As you work on some of these ideas, try to anticipate the sound of every note you play. This will help you sound more coherent and give you much more freedom in your music. I hope these ideas inspire you to find fresh new ideas on your instrument. It’s easy sometimes to get too caught up with music theory. Trying new visual approaches is a good way to get out of that and develop new licks. Practice these ideas and get comfortable with them. Be creative and musical. Practice well and keep it fun!